Well what a weekend, the Dublin Camogie Féile was a huge success, both our teams made their finals and represented the club so well over the weekend. 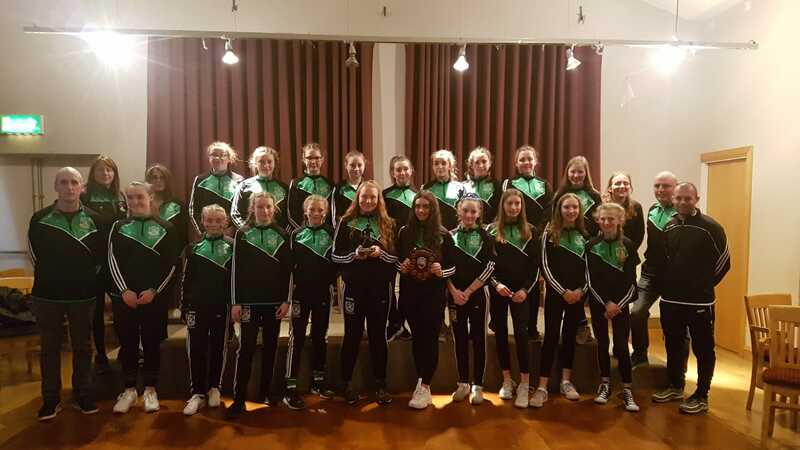 Our ‘DB’ Feile team brought home the Cup, a super performance and great recognition also for player of the tournament Caoimhe Costello. Well done to Pat Lambe, Alan Cherubini, Alan Lindsay, Csilla Kilduff, Jenny Costello and all the team and support staff. Commiserations to our gallant ‘D1’ team who lost out in the final, well done to the D1 team and management Donal Colfer, John Cosgrove, Donie Gaire, Alan Breen, Richie Kavanagh, Jennifer Fox, Antonio Sejean and all the support staff. Next Féile is Hurling on April 13th and the U14 hurlers warm up with two games over the weekend, the Minor Ladies footballers also had a great win away to Raheny, Minor hurlers sporting their new gear unfortunately lost out to St Vincents, our Inter and Jnr B footballers got their first wins unfortunately the Jnr A hurlers came up against a strong Olafs side. Senior Camogie lost out to NaFianna; the Inter Camogie team also lost out by the smallest of margins to St Brigids. Senior footballers continued their winning streak and made it 3 from 3 in the league and now sit top of Division 1 as they break now for Championship, their first game is the 12th April at 7.30pm vs Skerries Harps in Garristown, but first up is the Senior Hurlers this Saturday the 6th April at 5.45pm in Parnell Park, big support needed and appreciated. Lotto There was no winner of the lotto on the 27st March, Numbers were 1, 8, 14 and 17 . Next weeks’ jackpot €3,400, the draw will be managed by Seamus Clandillon and is sponsored by Clandillon Motors. Lucky Dips Winners: Shane Dobbs, Neil+Jacinta McKelvey, Joe Carberry, Will Garbutt, John McGivney. Play Online here, Or Tickets can be purchased at the Club, or in Kenny’s Vesey Arms. 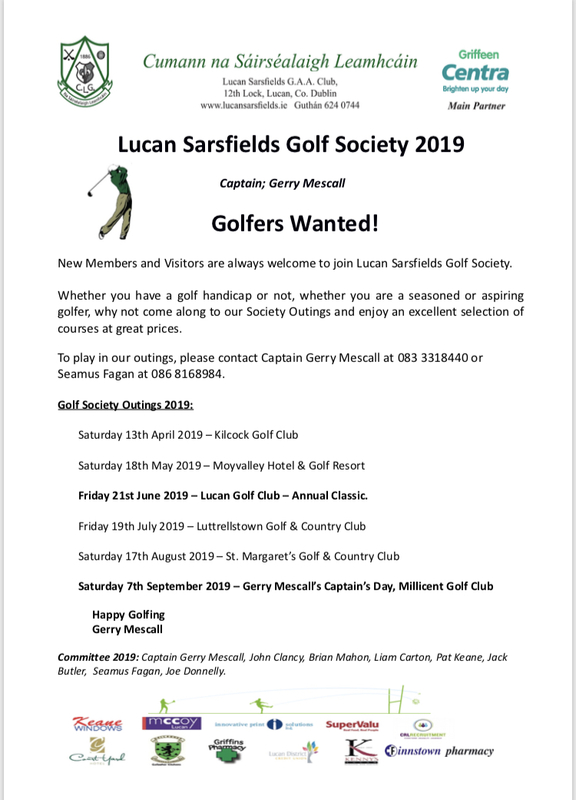 Lucan Sarsfields Golf Society's first outing of 2019 takes place in Kilcock Golf Club on Saturday 13th April. Timesheet is now open. Please contact Seamus Fagan at 086 8168984 to book your preferred tee-time. 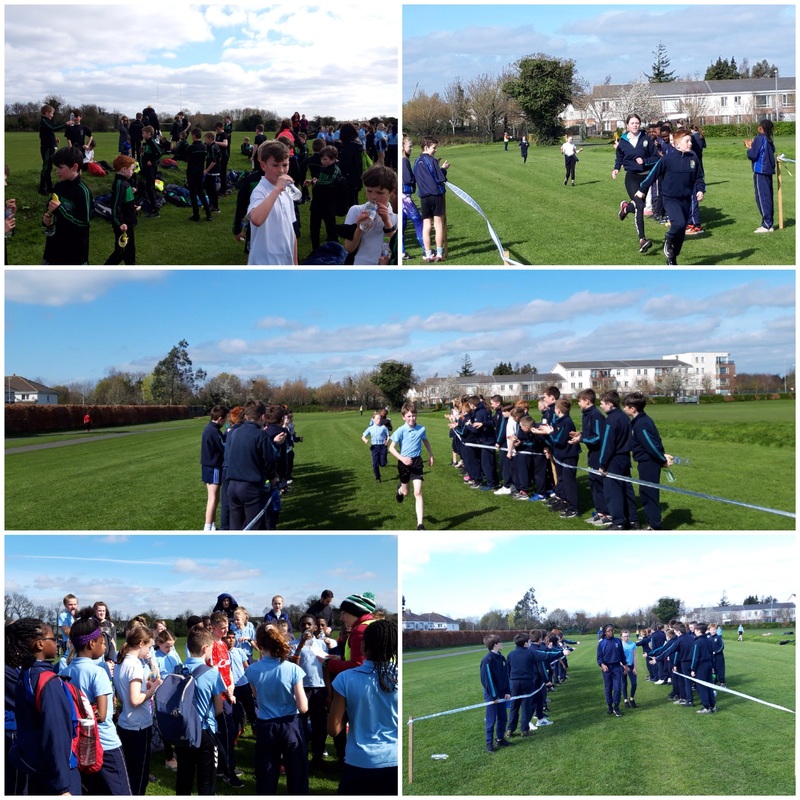 We had another great fun run organised by the Health Club Committee, St Mary's Bns, Scoil Mhuire Gns, Gael Scoil Eiscir Riada, Divine Mercy completed their 2nd 2k run in Griffeen Park. All four schools had an improved run time since the last run 6 weeks ago, which is thanks to the training they did in school and their competitiveness. Today the runners received a bottle of water which was donated by Celtic Pure and fruit provided by Dave Keenan. The Healthy Club Committee would like to again commend the schools and teachers for their participation and to the children who were fantastic and well behaved participants. This has been a very positive experience for the Healthy Club Committee who are promoting health and well -being in the community and the positive benefits of participating in sport was on display today. Thanks to all the stewards who assisted today, Paula, Daire, Pat and Philip and the community Garda, Anne, who came today to cheer the runners over the finish line. 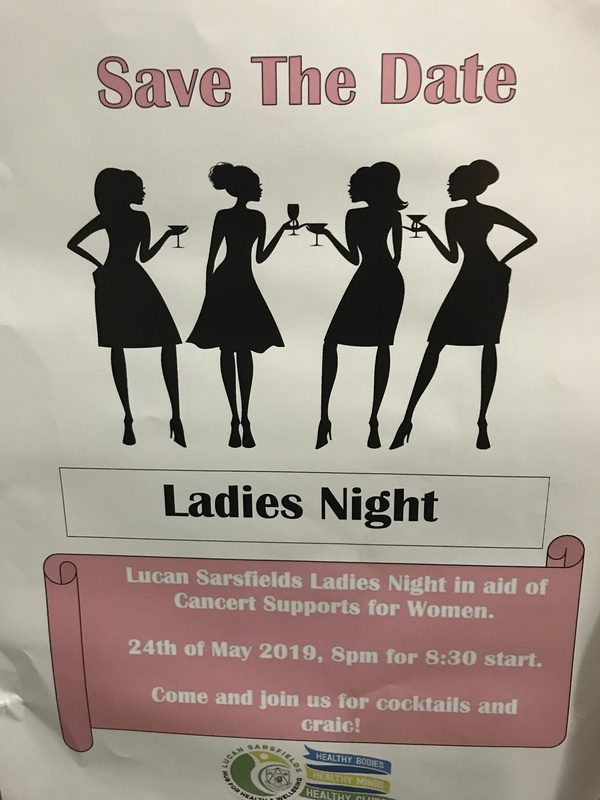 The Healthy Club’s next Event is the very popular Ladies Night In , which is scheduled for May, so keep an eye and ear out for more news on that. 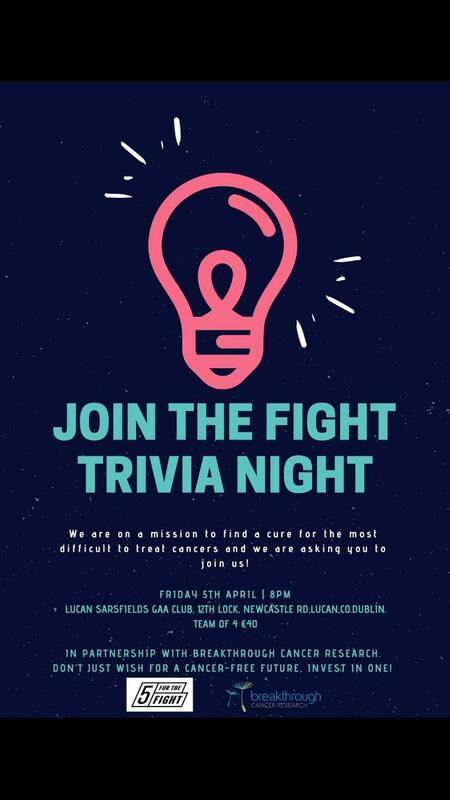 We have the Join the Fight Trivia Night this Friday, the 5th April in the club, the night is in aid of Breakthrough Cancer Research. 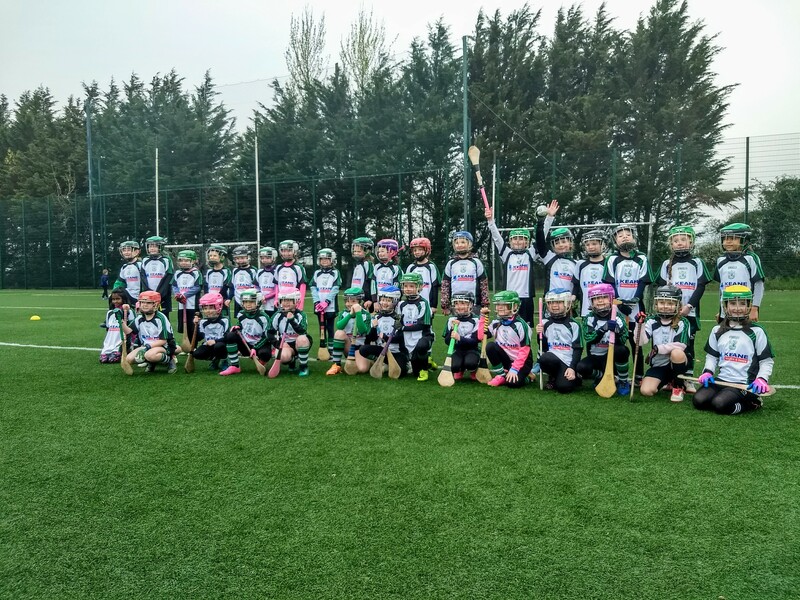 The U8 Camogie kicked off their 2019 season at home on the AWP against Round Towers Clondalkin. It was great to have the numbers to field 4 teams. It looks like a bright future for camogie at Lucan Sarsfields. 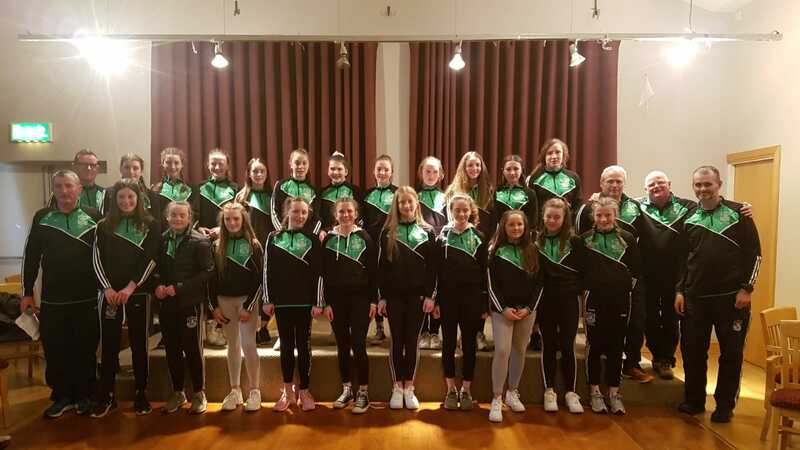 The Féile nGael camogie tournament was a huge success for Lucan Sarsfield’s this weekend with both the Division 1 and the Division 5 Under 14 teams making it to their respective finals. The Div 1 team put in some stellar performances in the qualifiers on Saturday beating Erin’s Isle and St Maurs for a well-earned place in the final on Sunday against Ballyboden St Enda’s in Lorcan O’Toole Park. Alas for the Div 1 team it was not to be their day. The contest was tight and tough with Lucan having the bulk of the possession in the first half. Our girls looked dangerous on several occasions with a couple of heart stopping near miss scoring chances which we didn’t manage to convert. The first half concluded with only one score on the board, a beautifully taken free by Lucan’s Aoibheann Stokes. The half time score was Lucan 0-1 BBSE 0-0. The second half continued in the same vein. BBSE eventually equalised well into the second half with a point from play. It was then neck and neck until Boden scored a goal with less than five minutes left in the game. The Lucan girls never gave up and every member of the team fought tooth and nail to the end but were unable to pull it back. All the girls were superstars this weekend, but special mention must go to Mille Hughes, Aoibheann Stokes and Lucy Fox for their heroic performances. And of course, Clara Finn, the Captain who showed the great courage and leadership both on and off the pitch that we have come to expect but do not take for granted. It was a disappointed but proud troupe that retreated to Lucan Sarsfield’s clubhouse yesterday evening. This feeling was somewhat assuaged by the great news that the Lucan Div 5 team were victorious Féile finalists and are through to the Nationals. Well done girls – Lucan Abú. Perfect conditions in AGP3 for this game v Vincent's who are one of the top teams in the league and this contest was a cracker. It was a tight and physical contest that never let up for the full 60 mins. Our task was made even more challenging when Dylan was handed a red card after two very dubious yellows with only 12 mins on the clock. The lads stuck to the task and were only 1 point behind at the break. Second half continued where it had left off with plenty of hefty challenges going in from both sides. Indeed with 8 mins left, lucan were a point up and looked like they had the momentum going into last few minutes. However, 2 goals in succession from Vincent's in the last few minutes was too much to claw back and the game finished on a 1 13 to 3 12 scoreline to the opposition. Even in defeat, there were plenty of positives to take from what was easily the lads best performance so far in the league. U14A The U14A Hurlers had a busy weekend as they played Ballyboden St Enda’s in the league on Saturday and followed that up with a challenge match at home against St Rynagh’s of Offaly. After a tough start to the league campaign with 2 losses so far, and performances below their own high standards, the team were determined to turn things around on Saturday and started the game in a very positive and aggressive manner. Every Ballyboden player in possession was hounded by 2 or 3 Lucan players who won a number of turnovers all over the pitch. That possession wasn’t initially converted to as many scores as it could have been and early in the second half Boden had closed to within a couple of points which didn’t reflect the game to that point. But the lads redoubled their efforts to run out comfortable winners in the end on a scoreline of 3-13 to 1-6. The 3 goals were scored after the Lucan defence turned over the ball and swiftly transferred the possession forward which reflected the huge effort the boys put in all over the pitch. In what was a great all round team performance it is hard to single out individuals but Daragh Lyons top scored with 10 points and Conor Greally bagged 2 goals. On Sunday we then hosted St Rynaghs from Offaly in a challenge game. 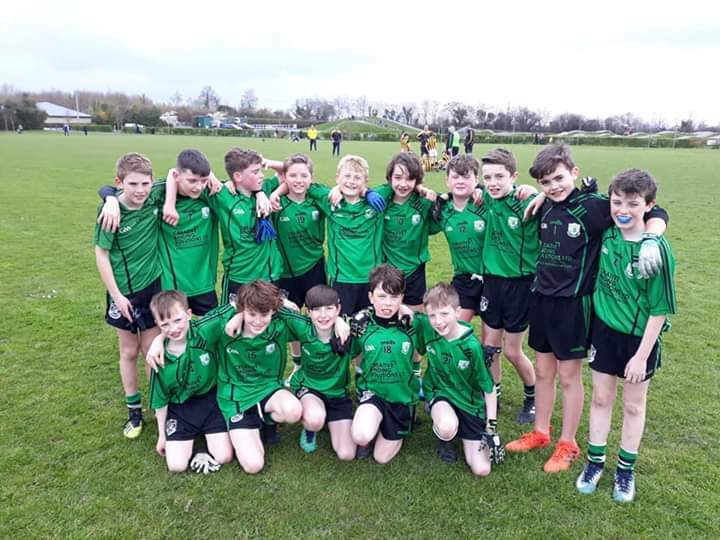 It would have been easy for the boys to rest on their laurels after Saturday but they were determined to show that performance wasn’t a one off and went at St Rynaghs with the same determination as they did Boden. This time the scores came a bit earlier and Lucan built up a comfortable 8 point lead with Kevin Gormley scoring the first goal of the game with a quick thinking handpass it to the net after a very good save by the visiting goalkeeper. However the visitors got in for a couple of soft goals to narrow the gap by half time. They came out very determined to close it further in the second half and raised the physical stake but the lads stood up to them and again reacted very well to losing a big lead and pulled away in the end to win on a scoreline of 3-13 to 3-06 As in Saturday’s game it was a great team effort but Sean O’Neill pulled off a couple of incredible saves and Cathal Kennedy and Ryan Clancy worked tirelessly in midfield to the end. Match Report: Lucan looked like a side determined to win this last tie before Feile from the moment they came on from the warm-up. The team wasted no time in getting on the scoresheet with two quick goals from full forward Callum Conway including a superb one handed overhead double on a high dropping ball from wing forward Conor Smullen. The Na Fianna forwards looked sharp too and were not short of chances at the other end. Good defensive work from Lucan full backs and excellent goalkeeping from Josh Murphy minimised the damage while Lucan continued to pick off scores, finishing the first half with a 3-6 to 1-3 lead. Lucan started the first half as they did the first with three quick goals effectively putting the tie beyond doubt and continued to add on scores as the game reached its conclusion. This was a very positive performance with all 20 players who took to the pitch playing an important part. The game was distinguished by courageous catching and tackling, super goalkeeping which highlighted the value of this aspect of training, wonderful team work and fluent scoring. Squad: Josh Murphy, Cian O’Driscoll, Sean Corry, Ryan Donnelly Sean Teehan, Aidan Barry, James Kearney, Isaac Kenny, Daragh Kenna, Conor Smullen, Niall Melvin, Ross Murray, Adam Kelly, Callum Conway, Sean Kearney, Daniel Mahon, Oran Fittion Ronan Munnelly, Killian Gormley, Liam FitzPatrick. U15A Hurling; Lucan 3-20. Na Fianna 1-09. Very much a game of two halves played in bright but very breezy conditions at the 12thlock. Na Fianna played with a strong wind in the first half with only 2 points separating the teams at half time with Lucan ahead at 1-10 to 1-08. Lucan took advantage of the strong wind in the second half and pushed on strongly to run out 3-20 to 1-09 winners. Scorers Joey Dunne 0-12, Liam Garrigan 2-4, Charlie Mulqueen 1-0, David Mulqueen, Adam Duffy, Finn Bruton and Joey McSweeney 0-1 each. U15B; A very good result for lads today 3G15P to 2G6P against a resilient Scoi ui Chonail. Scorers Tommy Mulhall 2G 6P (3F), Niall Higgins 1G5P (2f), Conor O'Neill 2P, Sam Donohoe 2p. U16A The 16A hurlers had a hard fought draw away to Na Fianna away. 1.10 to 0-13. It was game maybe where both teams feel they could have won but with the last puck of the game under massive pressure, Hugh Cuffe bravely stood up and stuck a free over from 40m out and a draw seemed a fair result. The lads played with a great attitude and aggression in the tackle. They dominated the second half but just unlucky not to put some more scores on the board in the first half into the wind, but what the management had asked for that lads gave in abundance; that was positivity and work rate. The defence was outstanding and other notable performance by Hugh Cuffe, Shane Coffey and especially from Adam White. It was nice to leave with a positive result and a first point on the board against the Div 1 Championship winners of last year. We are sure if the lads keep displaying that attitude and a high work rate, even better results can be got over the remainder of the year. 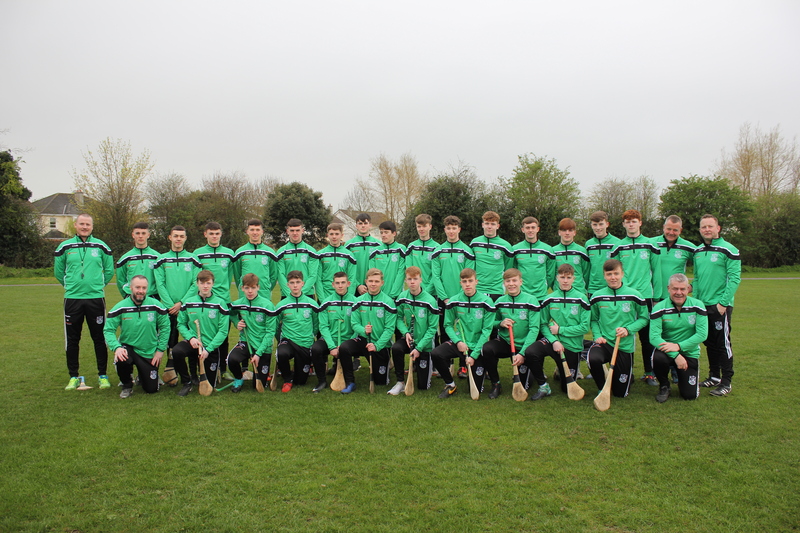 U16B; U16B Lucan Sarsfields U16B V’s Bray Emmets, Division 4 Hurling, 15:00 AGP0 30/3/2019. The first of 4 games in 2 weeks.Lovely sunny afternoon and not a drop of breeze the ideal day for a game of hurling between what has been in the past a very competitive matchup.With a squad of 23 the team choice was made easier with 2 out injured and 1 arriving with the flu. With about 20-25 people on the side-line the lads on the field got off to a flying start, by the end of the first half and some harsh calls by the ref the home side were down 4 points a splendid goal from Conor Devlin keeping us in the game on a score line of 1-1 to 0-8 six of their scores coming from the 13 frees conceded in the first half. With some changes at half time the game quickly heated up with scores on both ends 2 clear goal chances coming of the woodwork form a both Noah Kelly, and Lorcan O’Reilly. Bray continued to score the they scored 2 goals followed by 2 from Lucan, scores from Conor Cooper, Lorcan O’Reilly, Cian Ryan, Ryan Brant, then to level the game Deane Boylan slotted a free between the posts to level matters. In the last 3 minutes both sides fought hard especially the backs, a big mention to Conal Morris, Robert Hazley and Eoin Fitzpatrick all of which kept Bray scoreless for the last stage of the game. With 20 players on the team sheet everyone got a game. Match ended all square 3-9 to 2-12, both sides put on a great display. The ref taking time to mention to both sets of hurlers on what a good game of hurling it was. Most of the action this weekend was confined to the CCC1 teams. 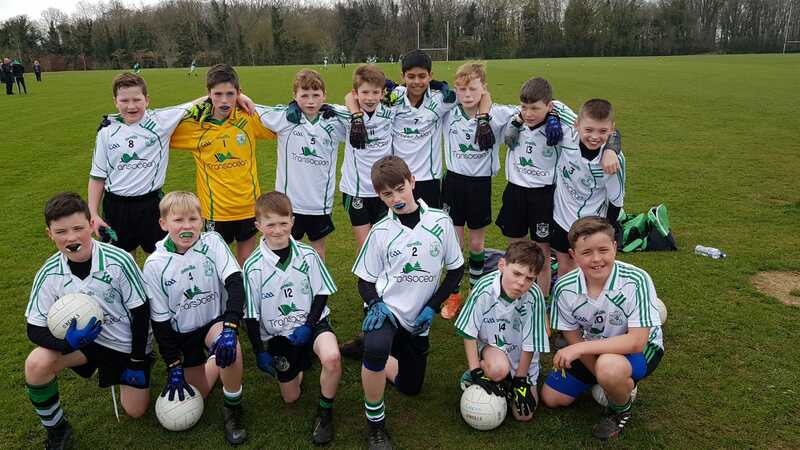 The Lucan U-8 team also represented the juvenile section at the senior football league game on Sunday morning versus Fingallians. The team formed a guard of honour for the team as they left the dressing rooms, played a mini blitz at half time in the senior match and enjoyed some refreshments afterwards. A big thanks to the U-8 management team for organising the event and the senior management for accommodating it. We hope the boys enjoyed the occasion. Our U-8 teams played some great matches versus Ballyfermot De La Selle at home and Naomh Olaf at home. The U-9 teams played Ballyboden at home and St. Patricks Palmerstown away on Saturday. The U-10 teams played Round Towers Clondalkin at home and Clanna Gael Fontenoy away on Saturday in some very competitive games. The U-11 teams were away to Round Towers Clondalkin on Saturday and also played away against Thomas Davis. The games were competitive and the boys showed some great skills across all of the games. All three U-12 teams were in grading league action again this weekend. Competition: U.12 Football E Blitz, Group 1 ( Round 5). Final Score: Lucan Sarsfield's 3: 5-04, Fingallian's: 7-03. Again there was another great turnout of Lucan footballers at Balheary on a perfect morning for football. This was the final match in their group prior to the start up of the league. From the throw-in the Lucan boys attacked but were punished by a quick Fingallian counter attack. Stung in action the Lucan footballers retaliated with a good attacking move resulting in a fine goal. The first-half continued in this fashion with only the odd score in the difference at the break. After the turnaround Fingallian's settled the quicker of the two teams putting clear water between themselves and the Liffey-siders. Despite this set back the Lucan players tightened things at the back and began to move the ball with a purpose through the lines. The result was goals and points that brought about a one score game. A goal by Fingallian's stretched their advantage but Lucan never gave up scoring two quick points in sucession. At the whistle Fingallian's finished the scoring with a goal and a hard fought victory. The u-12 Lucan Sarsfield's boys can be proud of their performace as they never gave up making Fingallian's work hard for their victory. Lucan Squad: E. Whelan, E Delaney, P. Devlin, J. Miller, L. Martin, A. Norman, L. Healy, E. Clarke, L. Kehoe, R. Keegan, C. Moloney, R. O'Flaherty, L. Enright, R. Melvin, P. Devlin, L. Mitchell, C. Mitchell, A. Bollard, C. McGinn, N. Jalzabetic and B. Fitzgearld. The U-12B team played Erins Isle in their last grading game. Lucan’s last grading game result wasn’t defined by the scoreboard but Lucan as a group was a big win. Some of the play on display yesterday was outstanding with some moves finished in fine scores. Erin’s Isle opened the scoring but Lucan responded shortly after with a goal from JP O Connor. It was pretty even up to half time with scores exchanged at either end. Half time score 1.4 Lucan 1.6 Erins Isle. Erins Isle scored first after the break and again Lucan responded with a second goal from JP O’Connor. It was evenly contested for most of the second half up to the last 5/6 mins when Erins Isle got their fourth goal. Lucan played right to the end which was the most pleasing part. That puts an end to the grading leagues and the way this team finished we can only look forward to the league campaign. Special thanks to Adam. Angad and Darragh who helped out with the squad out today. 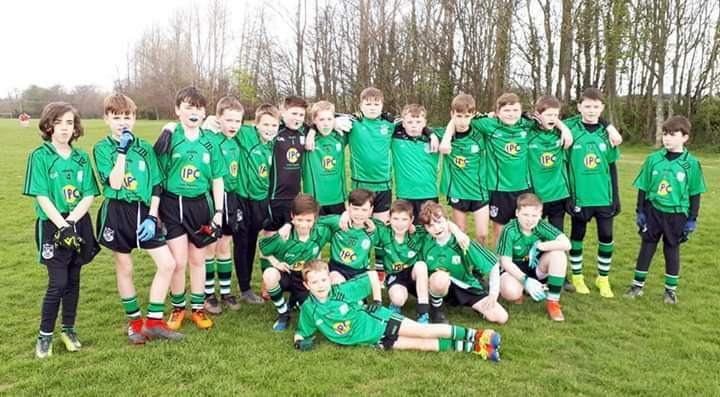 Lucans U12A footballers played their 5th and final grading league game at home to Naomh Mearnog in St Catherines Park on Saturday morning. In a top of the table clash against a strong Naomh Mearnog side, this promised to be a keenly contested affair and the early stages didn't disappoint with a huge effort from both sides. The Lucan boys were more than holding their own in the physical exchanges and with good team play and passing moves were creating some good scoring opportunities. Goals from Oscar Brennan and Michael O' Brien, either side of a long range point from Killian Costello put Lucan in a commanding position but some good Lucan chances were also being squandered by some poor shot selection. Naomh Mearnog were working hard and creating chances but their efforts were not being rewarded due to strong Lucan defending by Gavin Lynch, Cian Mc Cormick and Karl Quinn along with some good saves by Mark Byrne in the Lucan goal. Further Lucan scores including goals from Patrick O Connor, Oscar Brennan and Jack Mills left the Lucan lads in a comfortable position at h/t on a score of 5-4 to 1-2. In the second half Naomh Mearnog increased the pressure and with 2 goals and a point of their own reduced the deficit. The Lucan boys responded with a great defensive effort & with Daniel Taaffe, Cian Gavin working hard in midfield finished strongly with goals from Oscar Brennan and Killian Costello and further points from Jack Mills, Patrick O Connor, Daniel Taaffe and Cian Gavin to record their fifth h win on a final score line of 7-10 to 3-4. Well done to all boys on a great performance. We now look forward to them developing and testing their skills further while competing in the league for the rest of the year.